Crochet or Knitting yarn bowl - wording options are available during the check-out process. 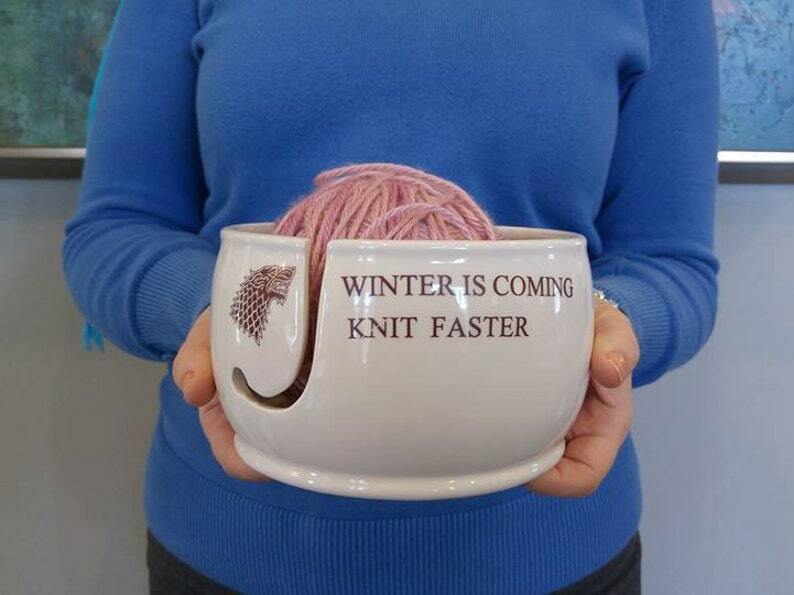 Game of Thrones "Winter is coming" knit faster. Winter is coming, crochet faster. *Personalize - If you would like to order a yarn bowl with personalization, please order from this listing and include the quote you would like. Completely handmade in our Charleston, SC home studio we are a small business servicing a large community of knitting, macramé, crochet artists and even the weaving community. We design, cut and apply all our lettering with the highest quality vinyl. Leave a note during check out what you would like on your custom yarn bowl. This makes a fantastic unique gift for your YARN FANS!! Knit, Crochet or Yarn bomber!! 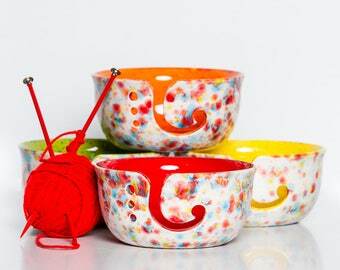 Everyone loves a yarn bowl. Approximately 2 pounds when packed and ready for shipping. As always, thanks for visiting! Ceramic Yarn Bowl | Pottery | Gift for Knitters | Yarn Bowl | Knitting Accessories | Knit | Crochet | handmade in my Charleston, SC studio. 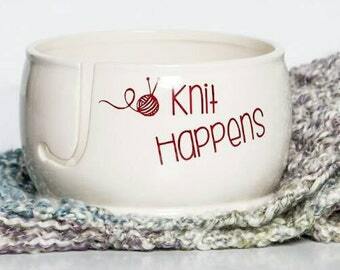 Beautiful yarn bowl, love it! Love the bowl, but just wondering about 2 things. Is your shop named, “C eat nappe?” My other questions is, can this bowl be put in the dishwasher or should I hand wash it? Thanks! LOVE THE BOWL! Direct Etsy Check Out, PayPal, Credit Card, Debit Card. Add my product to your cart. Click to check out & process payment. Wait for a delicious package to arrive at your doorstep. Return to your Etsy Purchase & leave a great review. I take great pride in my work and I hope that you love the things I make for you. If for some reason you are unhappy with your purchase please email me with your contact information and any concerns. Customer satisfaction is of the utmost importance and I am always eager to answer any question or concerns. Refunds are considered on an individual basis. Please contact me within 24 hours of receipt. Returns are subject to a 10% restocking fee. SHIPPING: I ship daily, M-F. Please check lead times on the product you are referring to. Many items I have ready to ship. If you are in a rush or time crunch, feel free to message me and ask if an item is ready to ship. INTERNATIONAL BUYERS: Returns, due to customs fees, will not be accepted. Please refer to your local customs office for more information. Please note that buyers are responsible for any and all duties and customs charges that may be incurred. Every effort is taken to secure items for delivery but if a shipping issue should occur, please contact me directly and I will be happy to work with you. WHERE I CRAFT: I work in a dedicated studio in my smoke-free home. PLEASE NOTE: All pieces are created by hand, so no two items are identical. That's the beauty of the product! Please allow for slight variances from what is shown in the made to order photos. - Sending an appreciation photo with your review is even better. I love customer photos. - Please like, comment or share on social media and I will be over the moon excited! To extend the life of your handmade ceramics, we recommend handwashing. To extend the life of your handmade ceramics, we do not recommend microwave use.